Most precious metals futures ended slightly lower on the week. Precious metals ended mixed Friday with losses in gold and silver cementing their weekly declines — albeit modest. Gold for December delivery edged down 80 cents, or less than 0.1%, to end at $1,291.60 an ounce on the Comex division of the New York Mercantile Exchange. Earlier Friday, gold scored its highest intraday price this year at $1,306.90 an ounce. "The selloff is unusual as there was no data or market news to account for the [roughly] $15 drop" from the day’s highs, MarketWatch quoted Mark O’Byrne, research director at GoldCore. "Risk aversion has eased with stocks eking out small gains [at the time of gold’s settlement] and some traders may have decided to take profits at the $1,300 level." "Eighteen market professionals took part in a Kitco News Wall Street survey. Fourteen voters, or 78%, see gold prices rising by the end of next week. Two, or 11%, voted lower, and the same number said sideways. The Kitco online Main Street poll resulted in 986 votes, with 645 participants, or 65%, calling for gold to climb over the next week. Another 280 voters, or 28%, said that gold will fall, while 61, or 6%, were neutral." Elsewhere, silver for September delivery shed 5.3 cents, or 0.3%, to finish at $17 an ounce. Silver futures declined 0.4% this week after rallying 5% last week. On Monday, they closed at $17.122 an ounce for their best settlement since June 14. Silver prices are 6.3% higher so far this year. October platinum rose 70 cents, or less than 0.1%, to $982.40 an ounce, but logged a 0.7% weekly decline. Palladium for September delivery added 95 cents, or 0.1%, to $927.10 an ounce — their strongest close since early 2001. The precious metal rallied 3.6% on the week. 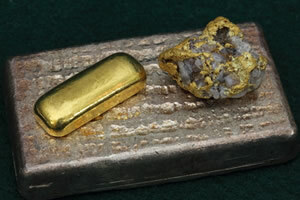 Both metals are higher on the year to date with gains of 8.5% for platinum and 35.7% for palladium. Gold gained $10.65 or 0.8%, to 1,295.80 an ounce. Silver jumped 13 cents, or 0.8%, to $17.15 an ounce. Platinum rose $10, or 1%, to $985 an ounce. Palladium added $5, or 0.5%, to $932 an ounce. For the week, advances totaled 0.8% for gold, 0.4% for silver, 0.1% for platinum, and 3.8% for palladium. Gold coin sales were muted after rising by 7,000 ounces previously with splits of 5,000 ounces in American Gold Eagles and 2,000 ounces in American Gold Buffalos. Silver coins advanced by 125,000 ounces compared to 110,000 ounces previously. American Silver Eagles accounted for all silver sales for a seventh straight week. i sea price of *palladium rising,? is the US Mint going to mint 1.oz American Eagle bullion palladium coin. Have they been stocking up over the years, when the price was low$, anyone know? The first palladium coin struck by the U.S. Mint in it’s history will be issued next month. It will also be the the first bullion version coin struck in high relief on both sides by the U.S. Mint! But you can’t buy it directly from the Mint. The Mint only sells its bullion version coins to it’s Authorized Purchasers, who then mark them up a lot & sell to the public (they have a 100% monopoly on U.S. Mint bullion coins). It will be a $25 American Eagle palladium bullion coin in 1-oz of .9995 fine palladium. The Mint has been stocking up on palladium for over a year now & palladuim spot price is up about 30% this year, so the Mint will make a fortune in profit on these new precious metal coins. A Proof version will be offered next year.